Statistic of the Week: Did the Trump Administration Meet its Regulatory Goals in 2017? 2.Statistic of the Week At the beginning of 2017, President Trump signed Executive Order 13771 that, in part, forced agencies to eliminate two existing regulations for every one new regulation. This is commonly referred to as the 2-for-1 rule. 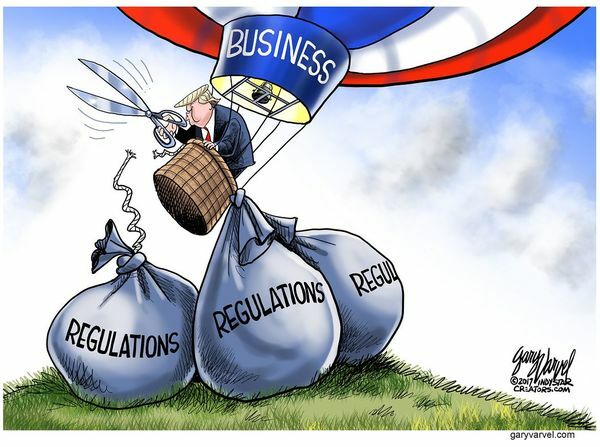 Well, the final numbers are in for 2017... according to the Office for Information and Regulatory Affairs (OIRA), the White House's top regulatory watchdog, agencies eliminated 67 rules compared to just three new regulations--better than a 22-to-1 ratio! You can read the full report using the following link and also learn how agencies eliminated $8.1 billion in regulatory costs (that is costs to businesses and individuals, not the federal government) at the same time. 3.Historic New Website The Environmental Protection Agency (EPA) has long been one of the most aggressive agencies in terms of federal regulation, creating some of the most expansive and expensive regulations on the books. However, in a sign of how much things are changing under the Trump administration's deregulatory agenda, the EPA, under the leadership of EPA Administrator and former Oklahoma Attorney General Scott Pruitt, has launched a website dedicated to tracking all of the de-regulation going on at the agency. This is perhaps the first time that any such agency has ever created a website exclusively about reducing the regulatory burden it imposes. Poke around and see what the Trump/Pruitt EPA is doing to get the government off the backs of individuals and industries by clicking the link below. 4.What to Expect in 2018 As mentioned above, 2017 was a huge year in terms of regulatory reform. But now it's 2018, so what can Americans expect this year? Well, we have a link to provide you with an answer. Every Fall, the White House publishes what is called the Unified Agenda. The Unified Agenda summarizes all the of the major regulatory (and now de-regulatory) plans for federal agencies. Follow the link below to see the Unified Agenda for yourself. The website allows you to easily navigate and find summaries of the regulatory and deregulatory plans for each federal agency, striking a good balance between thoroughness and accessibility. See for yourself what is planned by the Trump administration for 2018. 5.New Study Shows Rent Control Regulation INCREASES Rent While this study isn't talking about federal regulation, it's worth checking out because it shows just how easily well-intended government regulations and economic micromanagement backfire. The study, conducted by Stanford University economists, was just published by the National Bureau of Economy Research (NBER) and is titled "The Effects of Rent Control Expansion on Tenants, Landlords, and Inequality: Evidence from San Francisco." Here's a clip of what they found the regulations did: "landlords reduced their supply of available rental housing by 15%, by either converting to condos/TICs, selling to owner occupied, or redeveloping buildings. This led to a city-wide rent increase of 7% and caused $5 billion of welfare losses to all renters." Wow. Read the full study for yourself at the link below. 6.Famed Legal Expert Links Jobs Growth to Deregulation: Richard Epstein, one of the leading minds on constitutional law and economics, discusses how Trump's deregulatory agenda, particularly as it relates to employment regulations, is fueling a "Labor Market Resurgence." Epstein is a fantastic and entertaining writer and this latest piece is a must read. Find it at the link below. 7.Absurd Paul Krugman Claim Thoroughly Debunked The New York Times's resident liberal blogger and most-overrated "economist" in history, Paul Krugman, made an absolutely insane claim that there is no evidence that regulation harms investment. Robert P. Murphy, a much better economist with the Institute for Energy Research, thoroughly shreds Krugman's laughable claim and lists many, many examples of regulation deterring investment and shares several studies proving the strong link between regulation levels and business investment. Don't miss this one, click the link below. 8.Deregulation Aimed at Curbing Obamacare's Cost Explosion The Affordable Care Act, better known as Obamacare, has turned out to be anything-but "affordable." As FreedomWorks Foundation pointed out in formal comments to the Trump administration, Obamacare regulations such as unnecessary "Essential Health Benefits" requirements and the "Medical Loss Ratio" rules are driving up the price of insurance and healthcare itself. The good news is that the Trump administration, and particularly the Department of Labor, are doing something about these regulations. An editorial published by Investor's Business Daily explains how these regulatory changes will allow for companies and individuals to get around these onerous requirements and purchase more-affordable insurance coverage that better suits their needs. Read the editorial by clicking the link below. 9.Cato Institute's Regulation Magazine Every quarter, the Cato Institute publishes Regulation, a magazine filled with scholarly articles and other interesting reads about all sorts of topics related to... regulation! The Winter 2017-2018 is out and available for free online in PDF form. You can also subscribe to the magazine to receive a printed edition for a small fee. Click the link below to find the latest edition as well as links to older volumes. 10.TAKE ACTION: Repeal the Clean Power Plan The EPA has proposed to repeal the so-called "Clean Power Plan." The Clean Power Plan is one of the most expensive regulations ever created, estimated to cost nearly $40 billion per year! It is a back-door cap and trade scheme and has been criticized as unconstitutional by even the most liberal law professors, including one of Barack Obama's former Harvard professors! Right now, the Trump EPA is proposing to repeal this regulation, collecting public comments on the matter through April 26. Submit your comments in support of repealing this horrendous regulatory scheme at the link below. That's all for now! Check FreedomWorks.org or RegulatoryAction.org on January 26 for the next Regulatory Review. In this online euchre game, you are paired with a monkey. The other team is a pair of https://myeuchre.com mean-looking Your player is bats.